The act of walking above the centre of the Desfiladero de los Gaitanes gorge, at an altitude of 100 metres along the walkways or boardwalks which are fixed on the rocks of El Caminito del Rey path makes an impact which is 70% higher than going shopping or any other routine, according to the data obtained through the neuromarketing and technology research based on eye tracking, which was performed last January at this very spot and has just released the results. 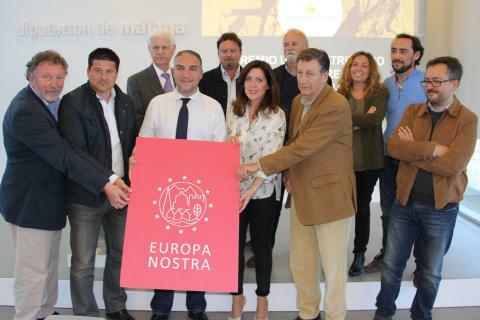 Today, on Wednesday 7th June, the Couny Council of Málaga has presented the above results together with Marina Bravo, the Environment and Territory Promotion Representative for the Málaga County Council, Francisco Campano, the manager of the Temporary Association of Companies Caminito del Rey, and director of Fusión Comunicación & Estrategia (responsible for the study) Gabriel Carrascosa. Ms Bravo explained that this study should be a tool for improving this experience, so thanks to the obtained data, the County Council is planning to perform some works on the exit from the path (where the level of excitement of the visitors falls), and make it more attractive. 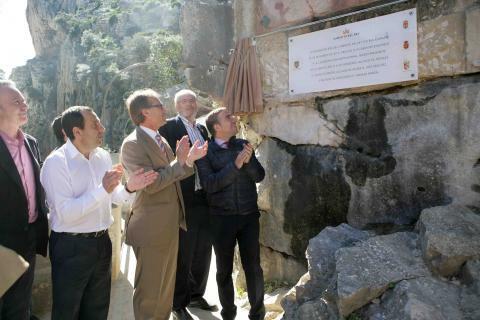 On the other hand, Mr Campano said that 'there are 600,000 reasons for doing this research because it was necessary to find out what more than 600,000 visitors have felt while hiking along this path since it was opened in order to make their experience better. We had to look inside these people in order to act on the outside and make a big change in managing El Caminito del Rey path.' This, he continued, was has motivated them to go further on and use this innovative technology which helps us find out the reactions and appreciations of those who come to the trail. 'Before the research we new that the visitors were happy with what they see, but we wanted proofs. This study helped us corroborate the emotional impact of theCaminito del Rey Experience,' Campano said. Mr Gabriel Carrascosa, the director of the company in charge of the research, stressed some interesting data according to which 98% of the visitors are focused on the path from its very beginning twice more than the average attention people pay on activities such as shopping or some other intensive urban actions. Besides using pioneer technology, the study included informal conversations with visitors at the end of the trail, during which 98% of them said that the Caminito del Rey Experience, was according to their expectations or above them and 97% of people said they would recommend it to their family and friends. Thanks to the study, the most exciting spots of the path could be discovered. Gabriel Carrascosa underlines: 'thanks to the research, we discovered six key spots where 100% of the tourists stop to observe.' he also explained that they used data such as the number of gaze points, or the moments when people were gazing while learning about something. The first of these spots where everyone stops is at the beginning of the boardwalks above the Gaitanejo Gorge, where the top eye-tracking device has recorded that the visitors gazed at the details of the construction, such as the links to the wall, steel and strand cables and wires. The second key spot were the zigzag steps which are commonly called 'butter or chocolate stairway'. 'This is where, for example, the river attracts an average of 135 gaze points', says Gabriel Carrascosa, thedirector of Fusión Comunicación & Estrategia . The existence of the old and new boardwalks at the same time was one of the most impressive images for the visitors. The old trail has received the largest average number of gaze points, according to the data obtained by this study. Mr Carrascosa ponted out that another spot that had obtained the 100% attention by the visitors was the railway which was embedded in the mountain. After this spot, the visitors stopped to admire the area made of glass with dramatic views of the landscape. According to the study, 49% of the time, the visitors observe the boardwalks. The last spot would be after the visitors leave behind the gorge Desfiladero de los Gaitanes, and stop to look back at it. The manager of the company in charge of the path said: 'we were surprised to see that 67% of the visitors looked back to admire the trail when they got to its end. It was as if they wanted to save the image of the Caminito del Rey Experience'. This data is going to be used to improve the zone and make it more interesting by applying the results. One of the aims of the study was making the guided tours more attractive to visitors. This is why Mr Carrascosa underlined that the data obtained through neurosensors shows that 49% of people who chose a guided tour paid more attention to the details. 'It was also rather relevant to see that 21% of the visitors came to the path for the second time, as well as that there were no important differences in the emotional impact provoked on men or women, or among the visitors from different cultures. 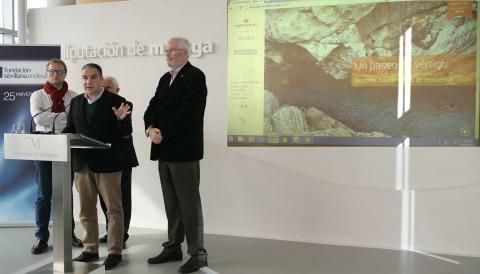 We can say that El Caminito del Rey is a universal natural beauty spot,' Mr Carrascosa concluded. 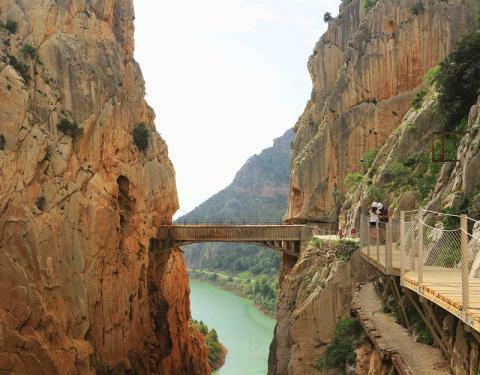 El Caminito del Rey is a tourist attraction placed in the Desfiladero de los Gaitanes Natural Beauty Spot, in the towns of Álora, Ardales and Antequera. The Gualdalhorce River flows below it, leaving behind El Chorro, Guadalhorce, Guadalteba and Gaitanejo reservoirs. El Caminito del Rey path is a trail which is up in the air, fixed to the walls of the Desfiladero de los Gaitanes gorge. It is 3 km long and 1m wide. One of its most famous parts is the hanging bridge, a walkway which is 105 m high. The rebuilding of the path was a real stimulus for the economy in the area. Starting from Febriary 2014, the County Council of Málaga, started the process of awarding the contract for the rebuilding of the path, which has finished in March 2015, when the path was reopened to the public. It turned from the most dangerous path in the world into a completely safe trail. El Caminito del Rey is opening to public visits after yearlong works thanks to the County Council investment of 5.5m euros.